Individual Patient Orthodontics by itself or in conjunction with other dental tools, can help correct almost every type of tooth and jaw misalignment. Tens of thousands of successful cases from all over the world have already proven that this is the most efficient way to straighten your teeth. See some common cases below that an IP dentist can help you with. Crowded Teeth — When the total width of your teeth is greater than that of the surrounding bone and soft tissues, teeth can become crowded, misaligned, and crooked. This often can cause hygienic and gum problems. 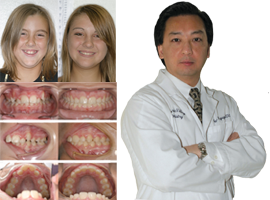 Braces will align teeth into a larger arc called an archform. The front teeth generally move forward as the teeth are straightened, proportionate to the amount of crowding. Your dentist makes your computer prediction and attaches your customized nickel-titanium archwire with “memory” to your specially designed IP Appliance® bracket. Since the customized IP bracket is bonded to the rotated tooth, it will gently reposition your teeth into alignment. Widely Spaced Teeth — This occurs when the total width of your teeth is less than that of your dental bone and soft tissues. This can happen if you have lost teeth, or your jaw has grown too much. Braces can help close the gaps between teeth. Treatment can help you prevent certain types of periodontal (gum) diseases and tooth decay. Overbite — This happens when your upper jaw protrudes too far in front of your lower jaw. This can happen if there is over growth in the upper jaw, or a lack of growth or missing teeth in the lower jaw. Dentists often refer to overbite as “overjet”. Overbites can cause uneven wear on teeth and painful functional jaw problems. Underbite — This happens when your lower jaw protrudes in front of your upper jaw. This often happens when the lower jaw over grows or there is a lack of growth or missing teeth in the upper jaw, and can be genetic. Dentists often refer to underbite as “reverse overjet”. Underbites can affect eating, speech, and jaw joint pain. Open Bite — This problem happens when your front upper and lower teeth do not touch when you bite normally. This can often cause lip incompetency (lips failing to touch when at rest), gummy smiles, airway problems, muscle strain, and abnormal swallowing. In conjunction with braces, you may be able to work with your dentist to control habits that contribute to your open bite. Closed Bite — When you bite normally, your upper teeth hide your lower teeth excessively. With normal bites, the bottom 2/3 of your lower front teeth is visible. Fixing closed bites can improve unwanted wear on your front teeth, correct abnormal breathing or eating habits, and align your muscles and jaws. Cross Bite — This happens when some upper teeth close inside (closer to the tongue than) the lower teeth. Cross bites can happen with the front and/or side teeth misaligned. This can happen if your jaws are mismatched in size or from genetics, and can cause skeletal asymmetry, bad wear on your teeth, and jaw joint pain (TMD/TMJ). 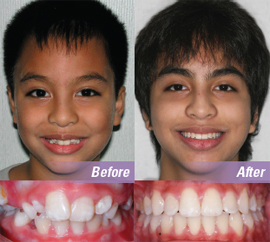 "Before my treatment, my teeth looked bad and I felt self conscious about my smile. Because this customized treatment, my mouth and facial features improved and I smile more, giving people the idea that I am friendly. I would go through the treatment again!"